Manufacturer of a wide range of products which include conveyor grinder machine, glass bottle crusher and blade grinder machine. We are the prime company, engaged in offering excellent quality Conveyor Grinder Machine. This machine is manufactured using the finest quality components with the help of ultra-modern technology under the supervision of our skilled professionals. The offered machine is used for finishing of ferrous and nonferrous metals. Clients can avail this machine from us in various specifications at very affordable price as per their requirements. We are counted amongst the leading organizations, engaged in offering excellent quality Blade Grinder Machine. 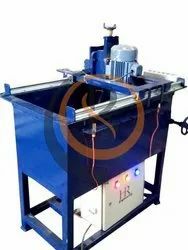 This machine is designed for grinding of paper cutting knife, reel to sheet cutter, plastic cutter, metal shear blade, etc. The offered machine is precisely engineered using the best quality components and advanced technology. We provide this machine in several specifications at industry leading price to the clients.